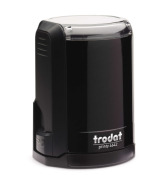 Trodat 4642 Round Self Inking Notary Rubber Stamp. 1.64" diameter. Includes protective cap to take your rubber stamp with you on the go. Trodat 4642 Round Self Inking Rubber Stamp. For round notary stamps. Includes a protective cap to allow for easy and clean storage and travel.